This is one of my favourite photos from Paul's Photowalk set. 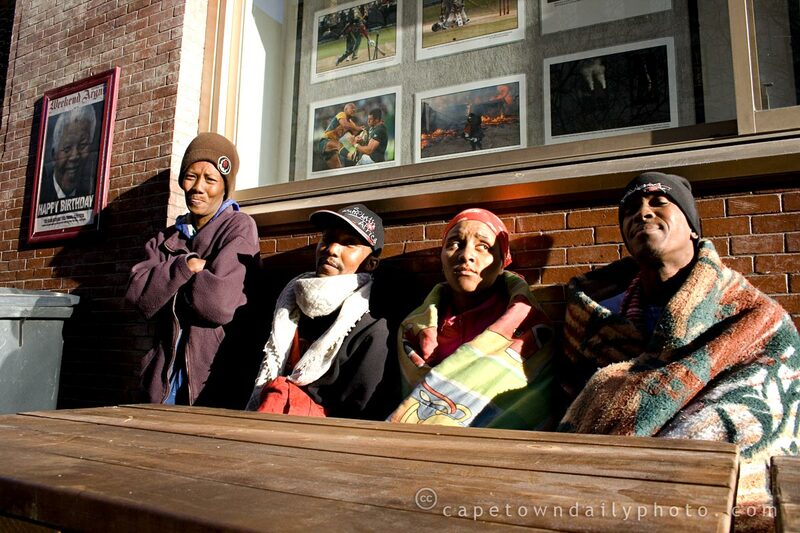 I love the facial expressions, the composition, the way these people were taking advantage of Saturday's summery weather to warm themselves up, the inclusion of the "Happy Birthday Madiba" poster to the left of the group, and the selection of photos on the wall just behind their heads. 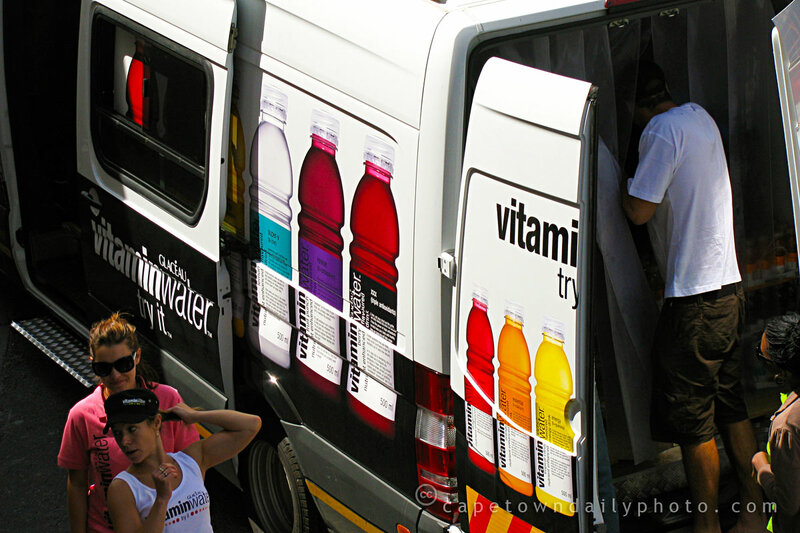 Posted in Street photography and tagged city bowl, people on Tuesday, 21 July, 2009 by Kerry-Anne. 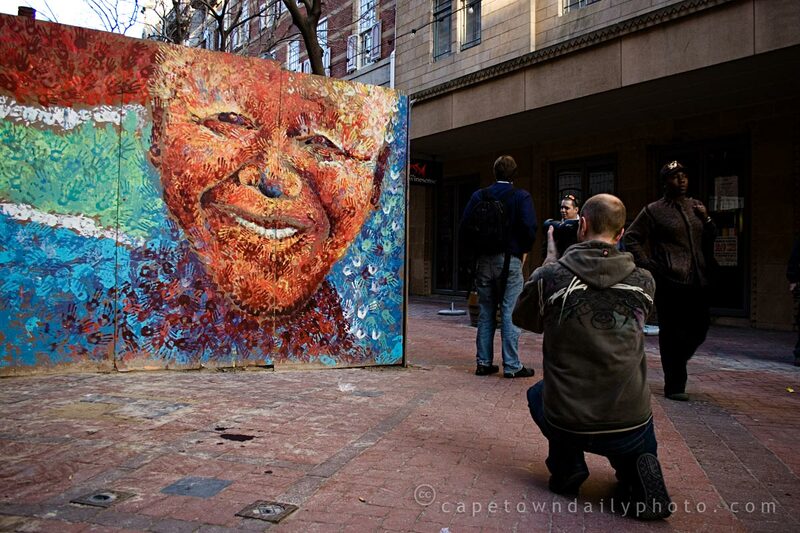 As many of you will probably know, today is Nelson Mandela's ninety-first birthday. Co-incidentally, it's also the day on which groups of photographers took to the streets of their towns and cities armed with cameras, to take part in the second global Worldwide Photo Walk. After our late night at Wakame, I momentarily regretted signing up for the walk, as it meant getting up in time to meet the rest of the group near the planetarium in Cape Town at 8am. But somehow I dragged myself out of bed, drove through to town, and met up with a group of about 20 photographers. 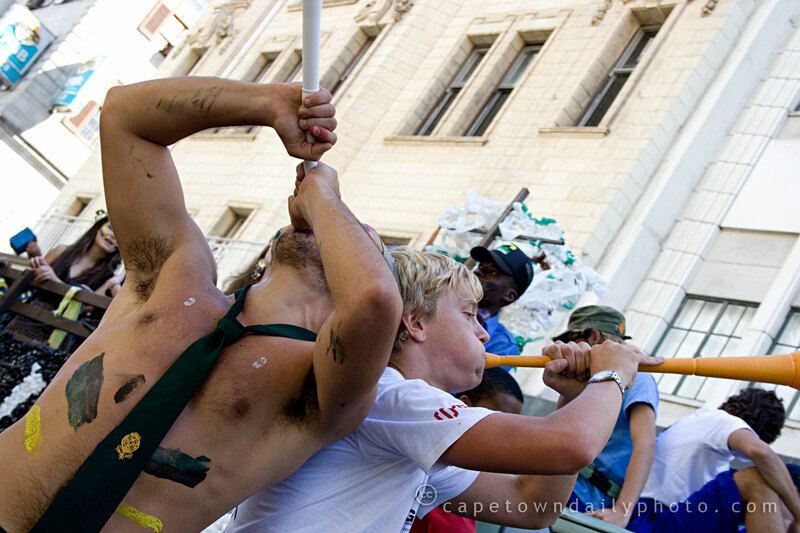 We spent the next two to three hours walking the streets of Cape Town, spending quite some time in the well-known open-air St George's Mall. In retrospect I was glad that I didn't bail on the outing - the weather was fantastic, the other photographers were friendly and fun, and there were almost too many great opportunities for photos. We'll be posting more of the photos from the walk over the next few days; but for now, let me close by wishing you, Madiba, a happy birthday and brilliant next year! Posted in Events and tagged art, celebration, city bowl, leisure, people on Saturday, 18 July, 2009 by Paul. This will be the third and last daily photo from my spectacular-spectacular helicopter trip over Cape Town's Table Bay. Shot while we were coming in to land, what you can see in this photo is (obviously) Table Mountain in all her splendour, and right in the middle the well-known Table Bay Hotel. What struck me as interesting in this photo is how large Devil's Peak (to the left) appears to be when compared to Table Mountain. 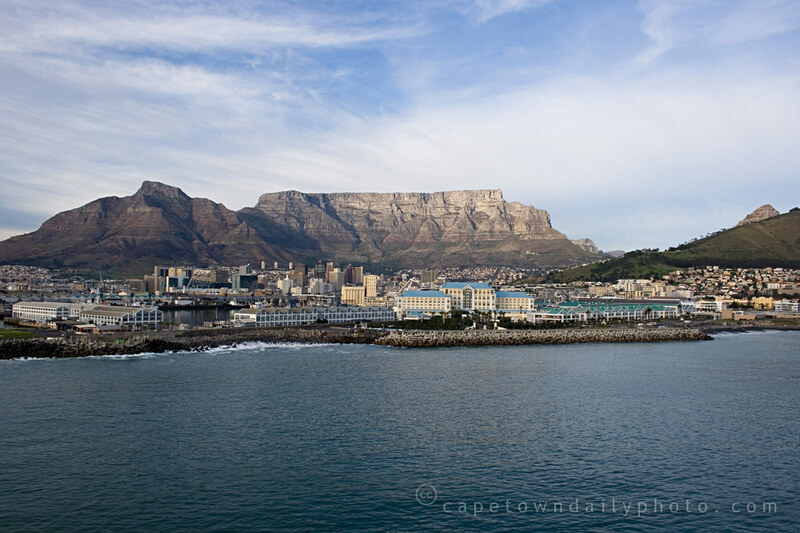 At 1 kilometre in height, it's only 87 metres shorter than Table Mountain, making it a fair-sized piece of rock! Visit the Wikipedia page about Devil's Peak - they have an awesome panoramic photo taken from the peak's summit. Posted in Landscape and tagged city bowl, sea, table mountain on Saturday, 11 July, 2009 by Paul. 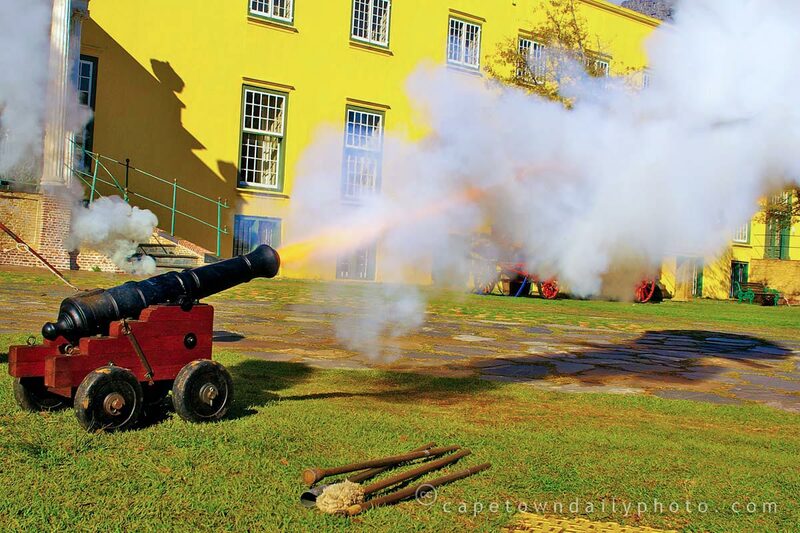 A friend of mine, Bennie Vivier, belongs to the Tygerberg Photography Society; the society members visited the Castle of Good Hope in Cape Town on an outing - an educational opportunity and a chance to capture some extraordinary photos. Some time ago cannons fell under the Firearms Act, which meant that they were governed by the same restrictions applying to modern firearms. The Cannon Society petitioned the authorities, and to satisfy the South African Police they drew up an official safety handbook, set up a code of conduct, and agreed to training courses for gunners. Today cannons and antique muzzle-loaded firearms have been deregulated and no longer fall under the Firearms Act (although a competency certificate obtained through proper training is required). Posted in Activities and tagged city bowl, history on Saturday, 27 June, 2009 by Paul. 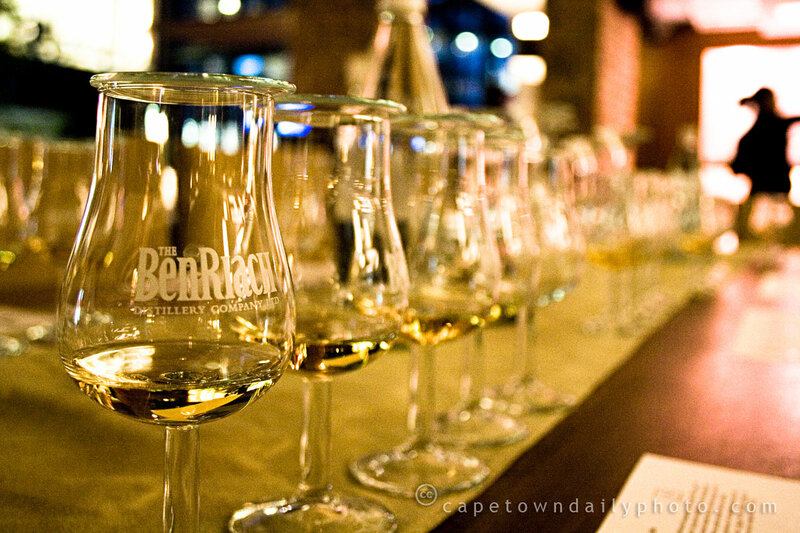 I mentioned in yesterday's post that we spent a great evening tasting BenRiach whisky, but I didn't tell you that the event was held at Sinn's Restaurant at Wembley Square. (You might recall us blogging about Sinn's in the past). It was the first time we'd eaten a meal at the restaurant - previously we'd only been there for snacks and drinks (very good snacks and drinks they were, though!). Our food was absolutely excellent (French onion soup, filled chicken breasts on a bed of mushrooms, and malva pudding with koeksuster/Amarula ice cream were a few of the options on our set menu), and the service was great. The waiters were incredibly polite and very efficient, and the portions of food were impressively generous. If you're a fan of value for money, then don't miss their winter specials - R99 for a 2-course meal or R125 for a 3-course meal, both including a glass of wine. If you're looking for a cosy but stylish spot for dinner, I can definitely recommend Sinn's. Posted in Activities and tagged city bowl, food, restaurant on Thursday, 11 June, 2009 by Paul. 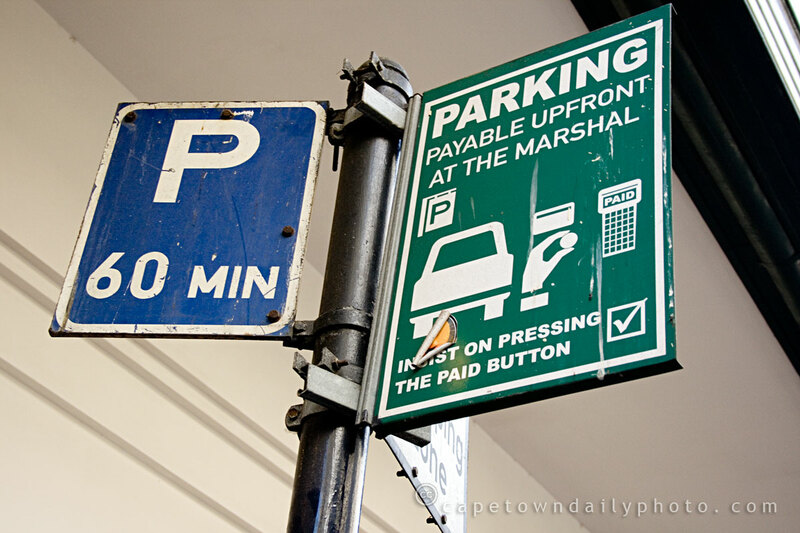 One of the great things about publishing this blog is that it really forces us to pay attention to the details around us. When you've lived in a place for a reasonable length of time, it's easy to miss all the small things that make it beautiful. Sure, you'll probably marvel at the tablecloth hanging over our gorgeous mountain, or spend time watching the sun setting over the ocean, but you're quite likely to miss the ornate doorway, the cheeky graffiti, the quaint cobblestones, the handwritten sign in a shop window, or the weathered old church-bell. 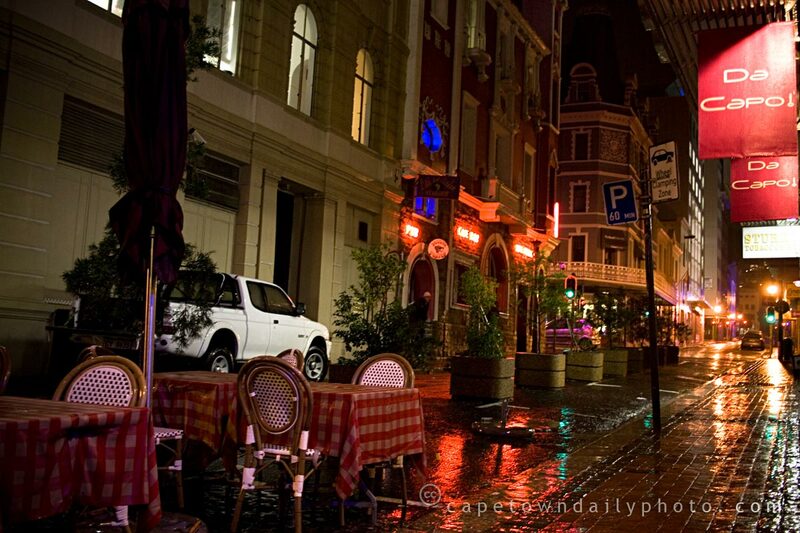 Part of our aim here at Cape Town Daily Photo is to draw your attention to these tiny facets of the city's character, whether you live in Cape Town or not. 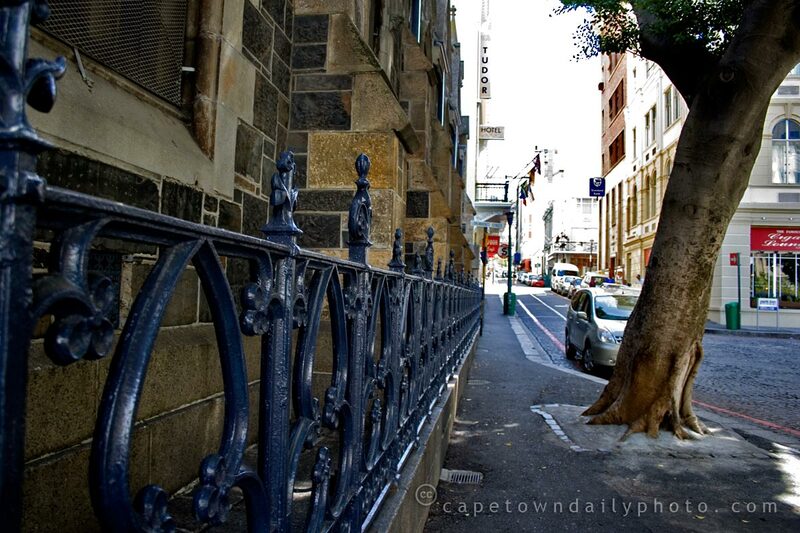 It's not always about the big landscapes, the bold architecture, the famous landmarks - sometimes the beauty of this city lies merely in the juxtaposition of a shiny wrought-iron railing with an old church's faded brickwork. Posted in Street photography and tagged city bowl on Wednesday, 1 April, 2009 by Kerry-Anne. Posted in Street photography and tagged city bowl, road, sign on Tuesday, 31 March, 2009 by Kerry-Anne. 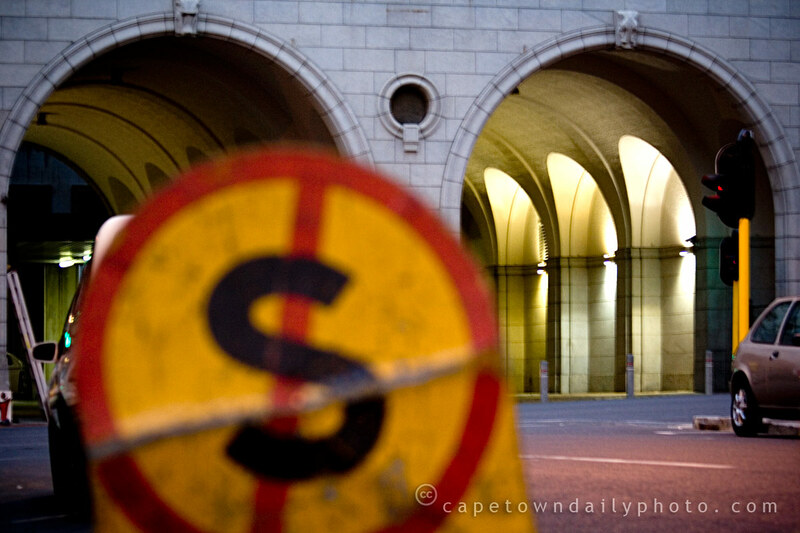 In the background of this photo you can see the arches of the Provincial Legislature Building, which houses the Western Cape Provincial Parliament. 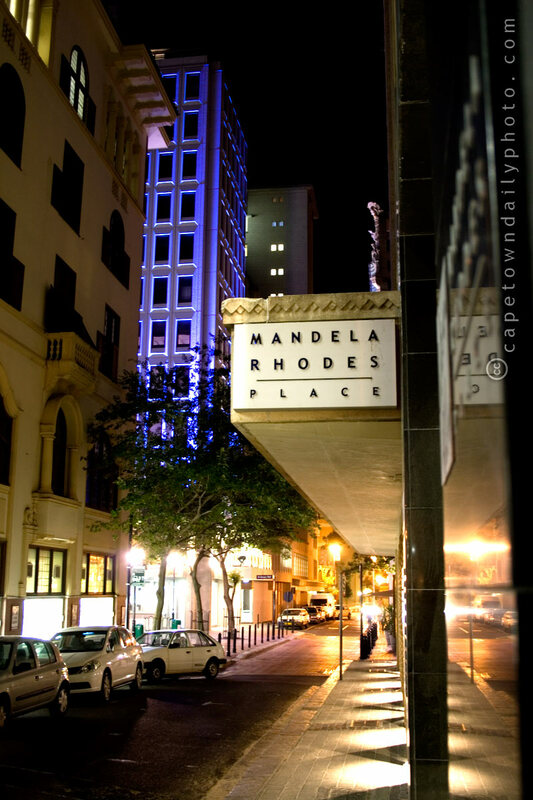 The building is located in Wale Street, more or less opposite Mandela Rhodes Place. If you see a sign like the one in the foreground, it means that you cannot stop your vehicle at the side of the road - even if it's just to pick someone up or drop someone off. This particular sign is a temporary one (they were doing some work at the side of the road and presumably didn't want anyone stopping while they were busy), but the markings on a permanently mounted No Stopping sign would be identical. Posted in Street photography and tagged city bowl, law, lights, night, road, traffic sign on Friday, 20 February, 2009 by Kerry-Anne. Mandela Rhodes Place is an upmarket mixed-use development located in one of the oldest parts of the city (very close to the Company's Garden, in fact). 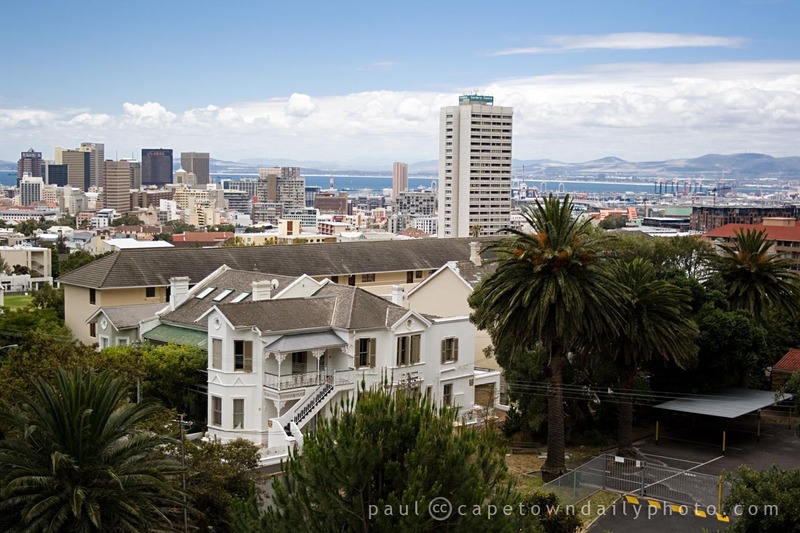 About four or five years ago the idea of inner-city living began to regain some popularity in Cape Town, and one of the most notable developments that originated during that period was Mandela Rhodes Place. 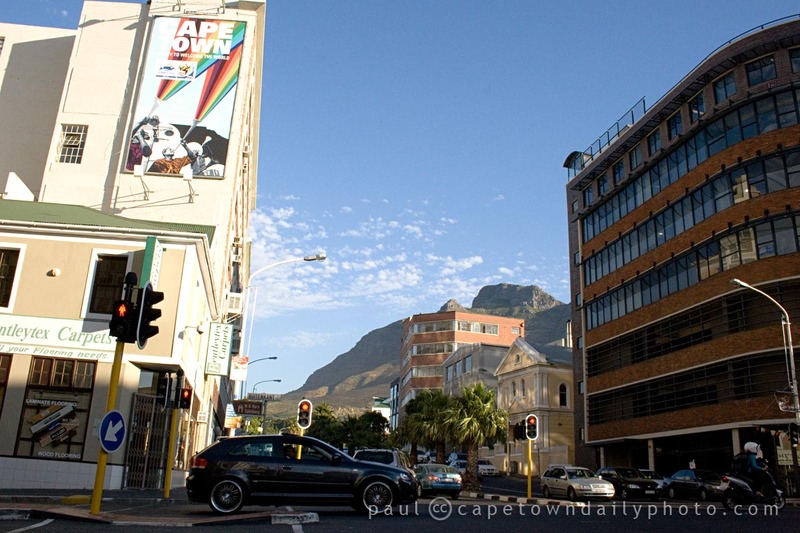 The developers, Eurocape, restored several old buildings on the corner of Wale Street and Burg Street, the idea being to preserve the facades and historical architecture of these buildings, while entirely revamping the interiors. Mandela Rhodes Place was launched in November 2006, and now houses a number of luxury apartments, a 5-star hotel, a winery, retail stores, restaurants, cocktail bars and coffee shops. I've only been there twice (at night on both occasions), but I must say, I love the atmosphere inside - it's quiet and stylish, with a real feeling of spaciousness. Posted in Street photography and tagged city bowl, hotel, lights, night, restaurant, road on Thursday, 19 February, 2009 by Kerry-Anne. 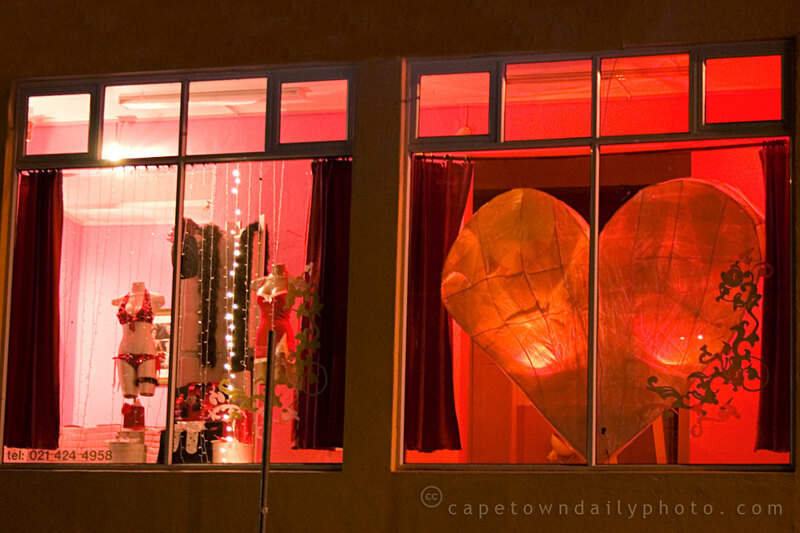 Yesterday had most of Cape Town celebrating Valentine's Day - restaurants were fully booked, and parties all over Cape Town were buzzing. While we were driving to the friend's party that I spoke of yesterday, Kerry-Anne spotted this lingerie shop in Kloofnek Road. Isn't it an awesome display? Posted in Street photography and tagged celebration, city bowl, love, shops on Sunday, 15 February, 2009 by Paul.